Fans of Back to the Future Part II have something to look forward to next year. Nike designer Tinker Hatfield has confirmed that the shoe company will release power laces inspired by the 1989 sequel next year. Here's what he had to say, during an appearance at Jordan Brand's Flight Lab space in New Orleans over the weekend. Of course, the year 2015 is when the beloved sequel was set, making it the perfect time for these power laces to debut. 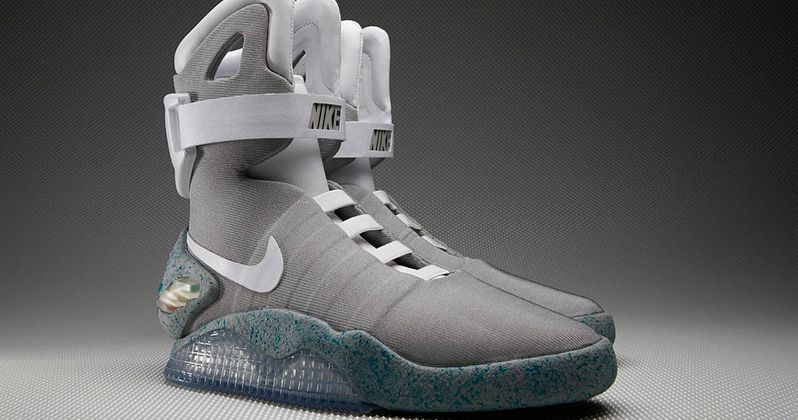 However, it isn't known if Nike is releasing the MAG shoe that they designed for the movie, which were worn by Marty McFly (Michael J. Fox), or if the power laces will be used on other shoes. Back in 2011, Nike created 1,500 pairs of the MAG shoes with the self-lacing feature that contours the shoe to each individual's feet, for a ten-day eBay auction, with all net proceeds going to The Michael J. Fox Foundation. You can also CLICK HERE to watch a featurette on these iconic shoes. Nike hasn't made an official announcement about the power laces or their MAG shoes at this time, but we'll give you the latest updates as soon as more information is released.